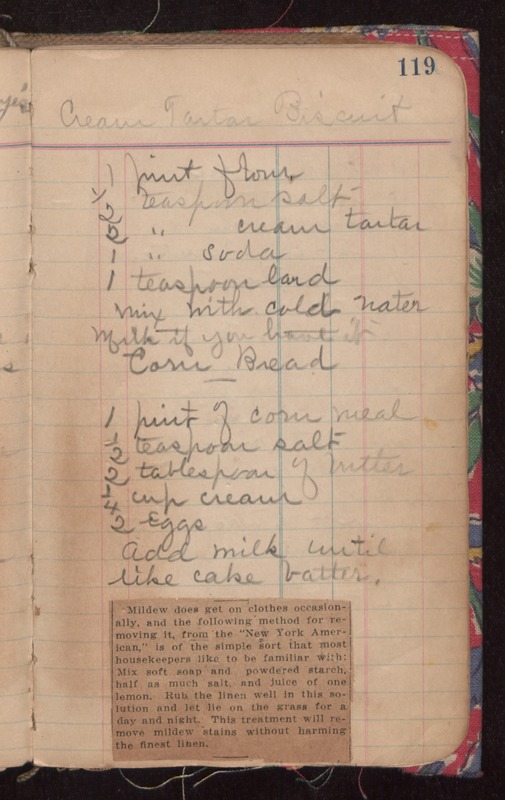 Cream Tartar Biscuit 1 pint flour 1/2 teaspoon salt 2 teaspoon cream tartar 1 teaspoon soda 1 teaspoon lard mix with cold water milk if you have it Corn Bread 1 pint of corn meal 1/2 teaspoon salt 2 tablespoon of butter 1/4 cup cream 2 eggs Add milk until like cake batter. Mildew does get on clothes occasionally, and the following method for removing it, from the "New York American," is of the simple sort that most housekeepers like to be familiar with: Mix soft soap and powdered starch, half as much salt, and juice of one 1 lemon. Rub the linen well in this solution and let lie on the grass for a day and night. This treatment will remove mildew stains without harming; the finest linen.